Description: Sega logo does not have Registered Trade mark on front, back or spine. Back is in 8 languages. 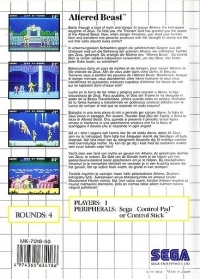 Box Text: Battle through a land of myth and danger to rescue Athena, the kidnapped daughter of Zeus. 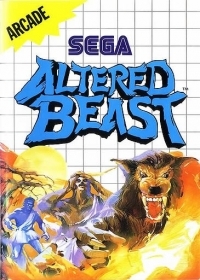 To help you, the Thunder God has granted you the power of the Altered Beast. No, when danger threatens, you shed your human form and transform into powerful creatures with the strength to stamp out the evil that lurks around every corner!